Eventhough my plans for going out to get fresh pumpkin for my pumpkin and rice pie failed today because I didn’t manage to get out of the house with the rain, I am glad that it rained today and not yesterday. My good friend L and I took our LO’s to Toi Toi at the Manoel. She had already gone to previous sessions and recommended that we go… and I am so glad I did. The sessions are held in what seemes to be the back side of the theatre (I could be wrong) but the entrance was at the back or side of the regular theatre entrance. Upon entering, we were met with a sea of strollers, and we rushed to find a corner to park our own. We were shown to a lift that went up 4 floors (which I had no idea the Manoel had) and we were asked ot take off our shoes before entering the performance area. The music stopped and we were rushed in, along with 2 other mommies and their LO’s. L and I scrambled across the stage area to find a place to sit, as the room was packed. We found a spot just to the left of the performers and we sat down. It was a very inviting informal setting, a setting I immediately felt comfortable in. The music started to play again and H and I were directly beneath the French Horn, and as soon as the horn made its sound, H started to pout, turned to grip me tight and gave out a short cry. He was startled by the horm and I suppose was just overwhelmed by it all. As the horn sounded again, I could tell that H was not comfortable so I moved up into the seats in front of the musicians and it was great. Some of the music they played: A Spoon Full of Sugar, Pachelbel’s Canon in D, and even a few folk songs in Maltese. 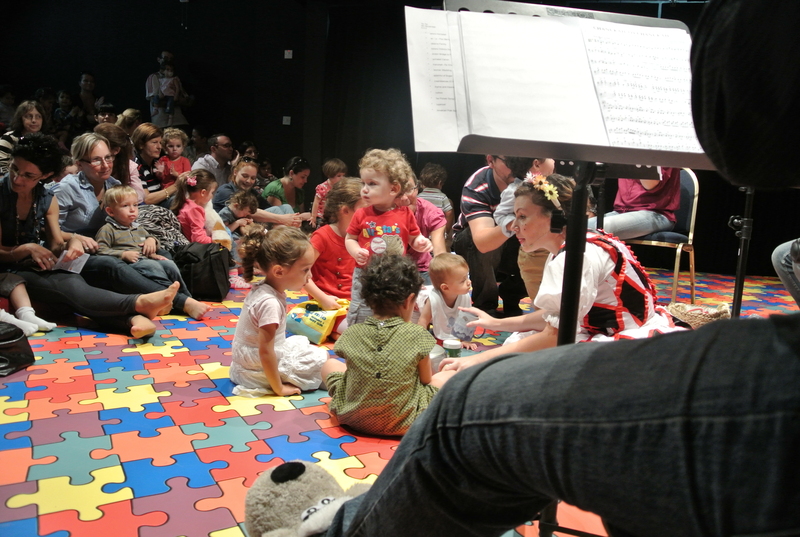 The adults were encouraged to sing along and the children were allowed to walk crawl freely where the musicians were playing as well. H was soon bouncing away on my lap, as long as he was away from the French Horn. Toi Toi is scheduled once a month in the Manoel calendar and we will definately be going again. More information about Toi Toi here.